Illinois Senator Emil Jones has been in the news a bit lately, so this week I chose to highlight the Illinois 14th State Senate District, currently represented by Senator Jones, to show yet another use for maps we create. Why would we want to map a political district? 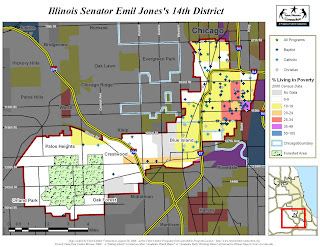 Well I think that an elected official can be a unifying figure in his/her district, and these maps, showing universities, hospitals, and churches, can be used as tools to help politicians and their constituants work to create strategies that promote the development of tutor/mentor programs. As we know by now, T/M programs have great success in getting kids off the streets and onto a productive career paths. So let's take a look at the maps that focus on the Illinois 14th State Senate District on the Southwest side. 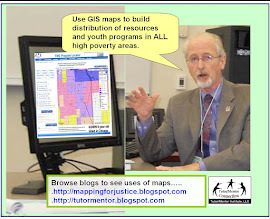 Each of these maps show locations of organizations who provide various forms of volunteer-based tutoring and/or mentoring during non-school hours. Descriptions of these individual organizations can be found using the Tutor/Mentor Program Locator Database. Notice that half of the district has relatively high poverty compared to the half that extends into the suburbs (near that big forest preserve). In this map, we also show Universities and Hospitals that may (or may not) already be working with the district's few tutor/mentor programs. As we've discussed in earlier blogs, Universities and Hospitals have important and intimate relationships with their communities, and can work to support the growth of Tutor/Mentor programs in their district. Imagine, for instance, that at each hospital or university on this map, a learning circle forms, each developing engagement strategies that help youth throughout the entire district. For more information, please review the presentation for the Tutor/Mentor Hospital Connection. We have also mapped a selection of Church Denominations. In fact there are so many, we broke this into two separate maps, each with a different selection of denominations. In the first map, again, we show poverty. Here we look at Baptist churches, Catholic churches, and other "general" Christian congregations. Churches of course could serve to host programs for kids and volunteers in impoverished neighborhoods. Additionally, if they are not doing so already, churches in the wealthier sections could be working to provide volunteers, funding and leadership to support the growth of existing tutor/mentor programs, helping to teach marketable skills to the community's future leaders. There are fewer Episcopal, Lutheran, Methodist, and Presbyterian churches in the district, as this map shows. Each of these locations represent sites where congregations can meet to learn about tutoring and mentoring, and where church leaders can evangelize to get donors to contribute to the growth of programs. Please take a look at Tutor/Mentor Exchange's suggested communications strategy for Faith Communities. The fact again, is that there just simply aren't enough green stars on any of the maps I make. Furthermore, existing programs such as Cabrini Connections, need funding from businesses and donors to continue working with students. Leaders in a Congressional or Legislative district can help mobilize public and private leaders and build the support that is needed for tutor/mentor programs throughout the district. I should mention, if it's not clear, that these maps are not intended to endorse, or criticize, the elected leaders in the district shown. The voters should make that decision. Failing Schools, Povery,... and Race?